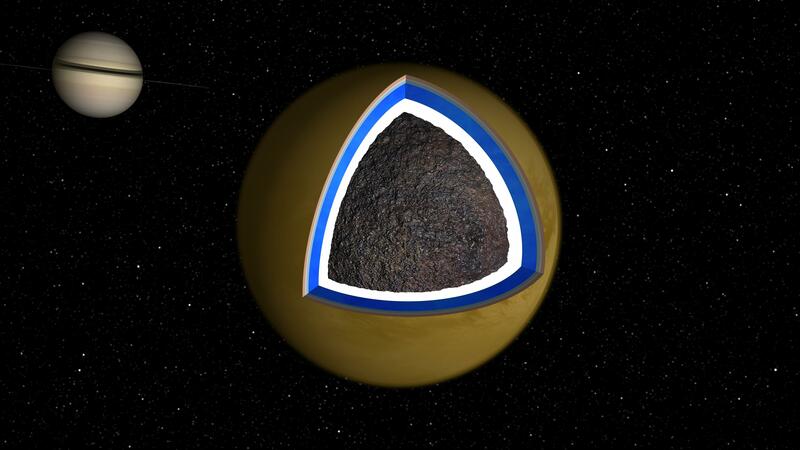 This graphic and animation depicts a cross-section of the Saturnian moon Titan. Cassini scientists speculate there may be a layer of liquid water mixed with ammonia about 100 kilometers (62 miles) below the surface of Titan. 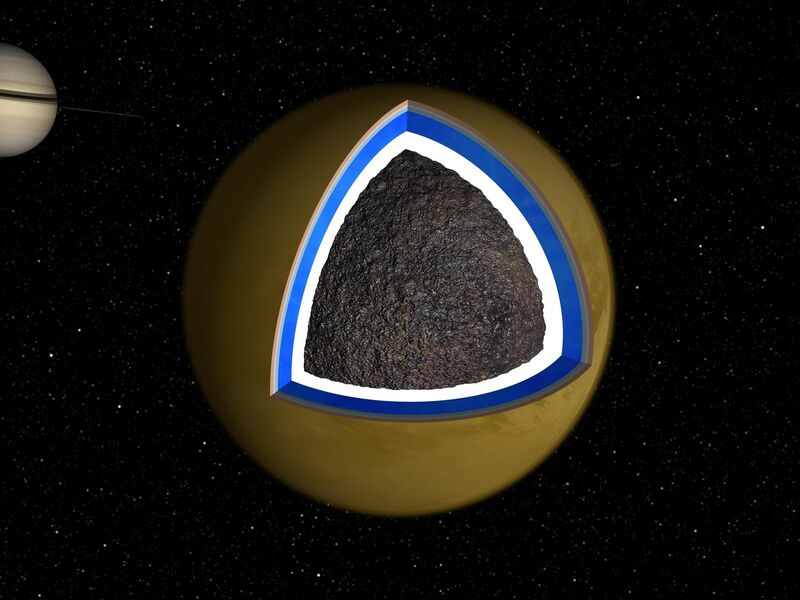 The assumption that Titan contains an internal ocean was generated from data gleaned from Cassini's Synthetic Aperture Radar during 19 separate passes over Titan between October 2005 and May 2007. Using data from the radar's early observations, the scientists and radar engineers established the locations of 50 unique landmarks on Titan's surface. They then searched for these same lakes, canyons and mountains in the reams of data returned by Cassini in its later flybys of Titan. What they found was prominent surface features seemed to shift from their expected positions by up to 31 kilometers (19 miles). Since the features could not have really moved, the apparent shift told the scientists and engineers that Titan was spinning about its axis in a previously unsuspected manner. 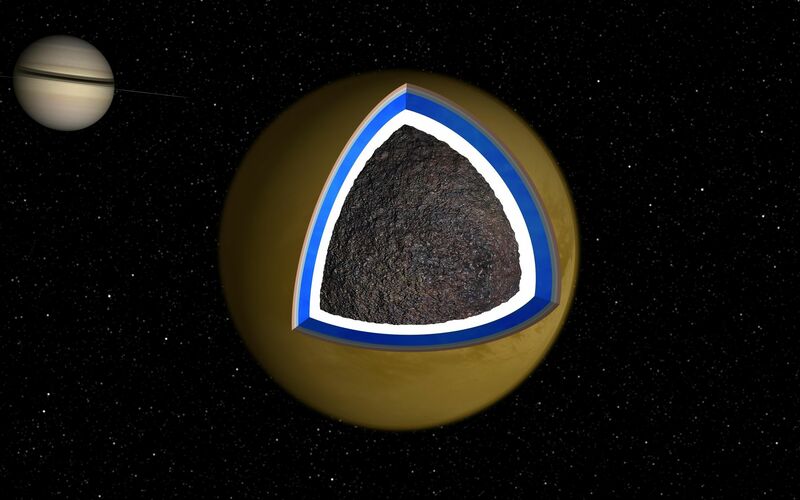 The pre-Cassini model of Titan's spin accounted for the gravitational fields of Saturn and other nearby planets and moons but omitted other smaller less well understood effects. Since the observed spin of Titan does not fit this model, other influences, such as the seasonal changes in the motion of its atmosphere must also be important. 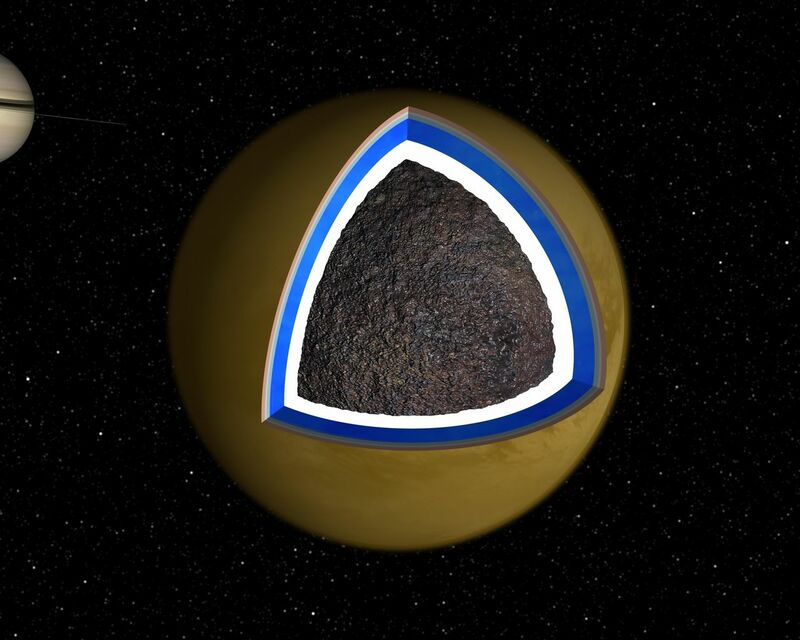 It is difficult to explain how such relatively low energy phenomena could have such a pronounced influence on Titan's spin unless the moon's icy crust was decoupled from its core by an internal ocean. If the crust were decoupled from the core, atmospheric fluctuation alone could account the observed spin. The Cassini-Huygens mission is a cooperative project of NASA, the European Space Agency and the Italian Space Agency. NASA's Jet Propulsion Laboratory, a division of the California Institute of Technology in Pasadena, manages the mission for NASA's Science Mission Directorate, Washington, D.C. The Cassini orbiter was designed, developed and assembled at JPL. The radar instrument was built by JPL and the Italian Space Agency, working with team members from the United States and several European countries. 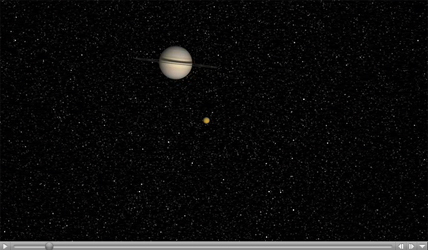 For more information about the Cassini-Huygens mission, visit http://saturn.jpl.nasa.gov/home/index.cfm.